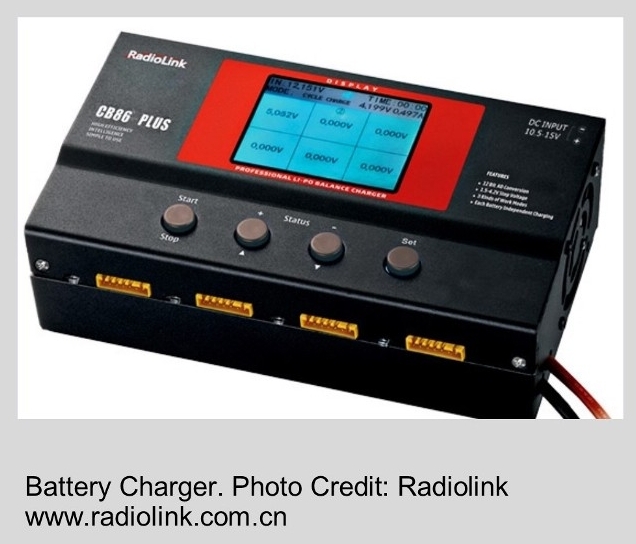 Batteries provide essential power to the motors, receivers and controllers. For multirotors, the most commonly used batteries are Lithium Polymer (LiPo) types, as their energy efficiency is high. Usually 3-4 cell batteries are used, which provide currents of up to around 5000 mah (miliamperes – hour) capacity. To understand what mah means, consider this example: a 3000 mah battery will last 3 times longer than a 1000 mah battery. Think of the charge (or load) in Amperes and time as similar to velocity and time. Velocity x time = distance. Here the distance is mah, so in other words, it is the distance you can go for so many hours at a certain speed. As the speed (ampere or load you use) increases, the time will decrease because you have a certain defined mah limit (distance). The advantage of LiPo batteries are that it can discharge at a much faster rate than a normal battery. It is recommended to buy a few sets of batteries, so that, when the first set is discharged, you do not have to wait for flying your drone again, and while one charges in the recharger, you can use the other battery. Some intelligent batteries on newer models have sensors and they can calculate its distance from you versus amount of power to return. Safety Note: Lithium Batteries can catch fire and you must check the requirements of the battery manufacturer for safe usage.